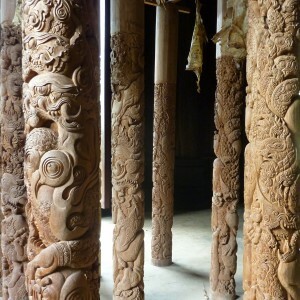 Woodcarving can be regarded as a characteristic decorative Thai art form. It reflects the fertility and vitality of nature in technique and subject matter. Wood has been primarily used for furniture and religious objects, and thus not so much for creating Buddha statues. Hence, woodcarvers have sought their inspiration primarily in nature and mythology since they have been free of restrictive iconography. Woodcarvers have employed a composite technique that allowed them to carve single parts of a work separately and later assemble them. Thus, the art work appears spontaneous and effortless, hence paralleling the creativity of nature. In tropical countries like Thailand, wood is an abundant material that is also considered to have a kind of spiritual quality. Therefore, trees are considered to house spirits. Among these spirits, the most well-known to Thai people are Phra Sai (the spirit of the banyan tree) and Phrase Pho (the spirit of the pipal tree). These are frequently mentioned in Thai literature and are included in the group of heavenly spirits. The other two famous spirits are Nang Tani (the woman spirit of the banana tree) and Nan Takian who is the female spirit of the hopea tree. Nevertheless, teak wood is preferred to other wooden material because it is easy to carve and relatively resistant to the elements and insects. 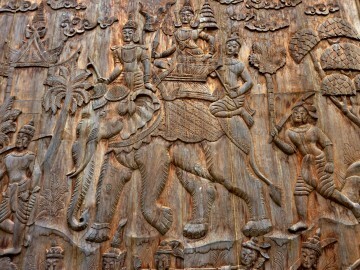 The earliest Thai woodcarving pieces date from the 16th century. The high-point of this Thai art form is found in images of lesser religious figures which date from the late Ayutthaya period, i.e. the 17th to early 18th century. 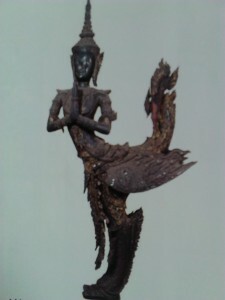 For instance, the collection of the National Museum in Bangkok includes such fine pieces like the mythical dancer and celestial swan Kinnari (in Thai: กินรี). The Kinnari is a mythological figure, an inhabitant of the Himaphan (Himalaya) forest, that is half-human and half-swan. It is a symbol of feminine beauty, grace and cultural accomplishment. The Kinnari statue at the National Museum in Bangkok is 110cm high and dates from the 17th to early 18th century. 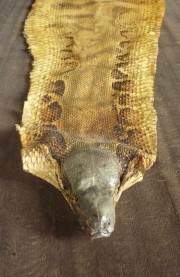 Its tail is in a stylized design which is called ‘kranok’. It is often found in Thai art. In fact, there had been a rich developing tradition of woodcarving in Thailand over prior centuries. However, earlier works, before the 17th century, did not survive. 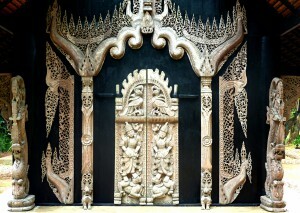 Nonetheless, this amazing workmanship continued into the early Bangkok period. Nevertheless, in the most recent past, Thai National Artist Thawan Duchanee also created stunning wall and façade carvings at Baan Dam, the Black House Museum in Chiang Rai. 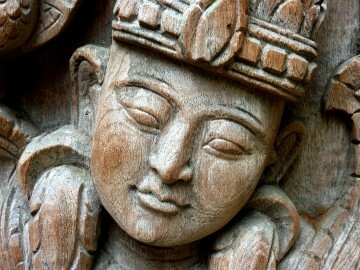 Even today, woodcarving is a prominent art in Thailand. Thus, the finest wood sculptures have been closely associated with architecture, animals being a favourite subject. You can buy objects carved from wood at special markets like the cultural and craftsman’s market in Chiang Mai. The following video shows you which kind of objects are created and available at these markets. 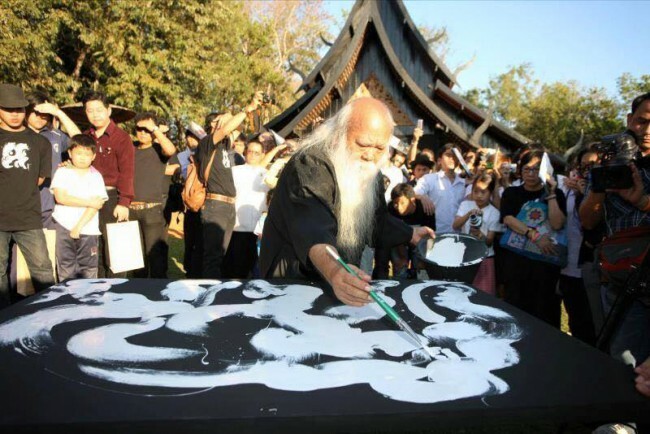 In addition, it also relates something about the history of this art form (in Thai). By the way, there is also a new privately-owned museum named Woodland in Nakhom Pathom Province. The presentation is about a fantasy land and Grandfather Teak who relates the story of the woodmen in thousands of elaborate woodcarvings. 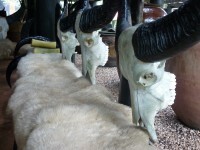 These sculptures are from a collection owned by Narong Thewphaingarm and his father. 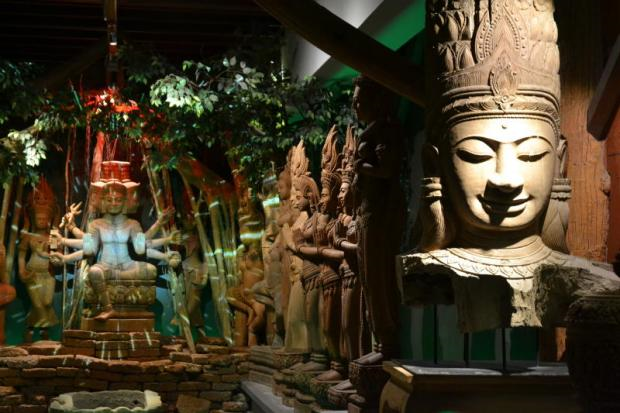 There are three areas in the exhibition: firstly, the Story of Woodland, with over 5,000 wooden objects, secondly, Woodland Village where you find restaurants and souvenir shops, and thirdly, the Resort, which is the former residence of the owner’s family. 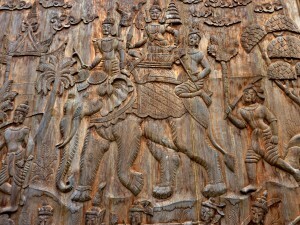 Finally, we may say that Thai woodcarving has a great tradition in Thailand. It is a very elaborate, amazing and stunning craft that requires a lot of skill by the craftsman. I’ve recently written an article about ‘Baandam’ the Black House which was designed by Thai National Artist Thawan Duchanee. The Black House is located 10km north of Chiang Rai. In point of fact, in Chiang Rai there is also a White Temple (Wat Rong Khun) created by the Thai architect Chalermchai Kositpipat. 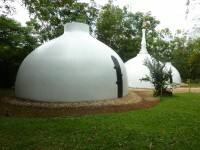 Thus, White Temple and Black House form a strange of juxtaposition to each other since they are both located near Chiang Rai. The Black House can be described as dark, macabre and mysterious whereas the White Temple seems to be ethereal, pure and even other-worldly. Thus, the White Temple and the Black House are indeed opposing buildings. In addition, another peculiar coincidence is that the White Temple was built by Chalermchai Kositpipat who was the student of Thawan Duchanee who built the Black House. 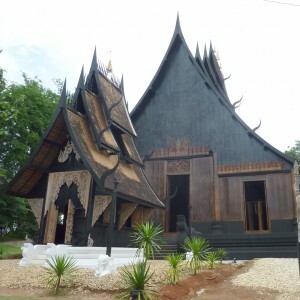 Here you see a video of the art installation of ‘Baandam’, the Black House in Chiang Rai. I think it captures the macabre glory of the Black House very impressively. The following video captures the spirit of the White Temple, it shows how visitors pass over sculptures representing the desire to reach the main building of the temple in order to pay their respects to the Buddha image. Adorned with sparkling mosaics, the structures gleam in the sunlight. There are also other areas which allow visitors to make merit and write their wishes and hopes on medallions to hang around the White Temple. Which one of the two places do you find more appealing? The White Temple or the Black House? I find both, the white temple and black house, are very impressive and fine examples of Thai architecture. What is more, they also reflect aspects of Buddhist art in different ways and that is what makes them so special in my opinion. 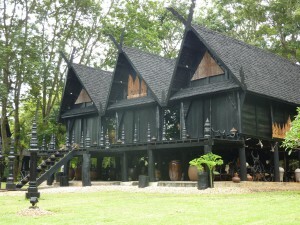 ‘Baandam’ is the Black House Museum designed by Thai National Artist Thawan Duchanee (1939-2014). ‘Baandam’ is a complex of over 40 houses which are situated 10km north of Chiang Rai. 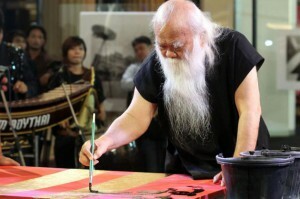 Thawan Duchanee is a prominent representative of Thai and Asian art. He started his artistic education at the Poh Chang Arts and Crafts College. Thawan Duchanee then studied at Silpakorn University under the Italian painter Corrado Feroci (Silpa Bhilasri) who is known as the father of modern Thai art. Thawan Duchanee is also familiar with Western artistic traditions since he also studied at the Royal Academy of Visual Arts in Amsterdam. 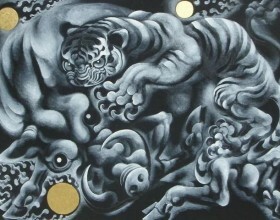 Returning to Thailand, Thawan Duchanee developed a signature style of artistry using predominantly black and red tones. 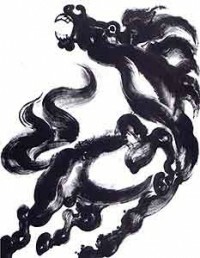 This is based on the styles of traditional Buddhist art and is supposed to symbolize the darkness immanent in humanity. 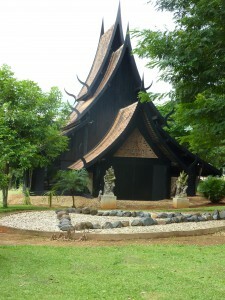 This tendency is also reflected in the Black houses of ‘Baandam’ in Chiang Rai. Thus, the Black Houses are designed in different styles and what is special about them is that their colour is predominantly black. Hence, there are also some white buildings but their only function is to bring out the Black Houses even more distinctly. Most of the Black Houses of the ‘Baandam’ Museum serve as a kind of ‘showroom’ for various artefacts, curiosities and oddities. Nevertheless, ‘Baandam’ a special kind of museum because the objects and artefacts of the Black House Museum are all related to death, mortality and impermanence. In other words, one may also say that they highlight the negative side of nature. 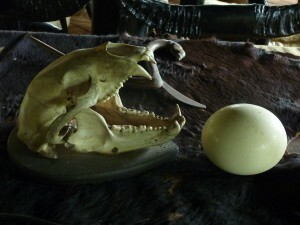 Hence, there are many skulls from different animals as well as skins (e.g. 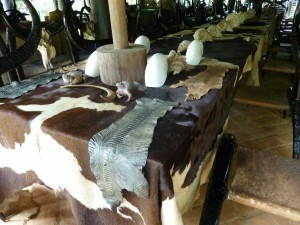 snake skins), hides, eggs and carvings of more traditional demons. In addition, ‘Baandam’ also has interesting furniture and special collectors’ pieces to offer. 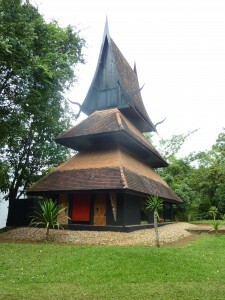 I am very much impressed by Thawan Duchanee’s art and the Black House Museum in Chiang Rai, in particular. I think it is the mixture between traditionalism, curiosity and oddity and makes it so special. 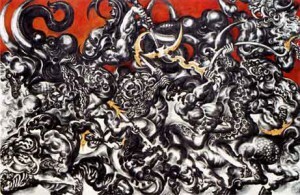 Considering Western artists, I think the Swiss surrealistic artist H.R.Giger would have loved ‘Baandam’ and its oddities! Have you been to ‘Baandam’ and do you like this museum complex?